We’re driving more, and more of us are dying on the roads. Four days before Christmas, on a Wednesday morning just after dawn, Elizabeth Meyers was crossing Sandy Boulevard in Portland, near 78th Avenue, just about a block from her neighborhood library. 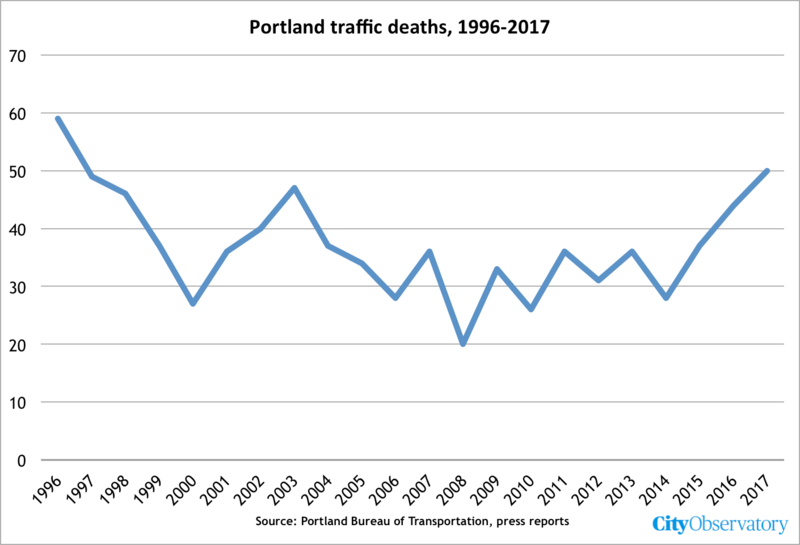 She was struck and killed, becoming Portland’s 50th traffic fatality of 2017. Vision Zero, a bold road-safety campaign with its origins in Scandinavia has been sweeping through the US for the past decades, prompting all kinds of tough-talking, goal-setting traffic safety campaigns. And admirably, Vision Zero is designed to be a results-oriented, no-nonsense, and data-driven effort. Fair enough. After averaging 31 traffic deaths per year between 2005 and 2014, traffic deaths have jumped 60% over the past three years.
. . . don’t blame high traffic death rates on inadequate traffic safety efforts, blame them on higher per capita vehicle travel, and therefore automobile-dependent transportation planning and sprawl-inducing development policies; those are the true culprits. The effects are big enough to show up in mortality statistics: American children are twice as likely to die in automobile crashes as are children in other advanced countries, which is a major contributor to the higher child mortality rate in the US. After more than a decade of moderation in driving (motivated largely by high gas prices), driving in the US started increasing again when oil prices collapsed in 2014. 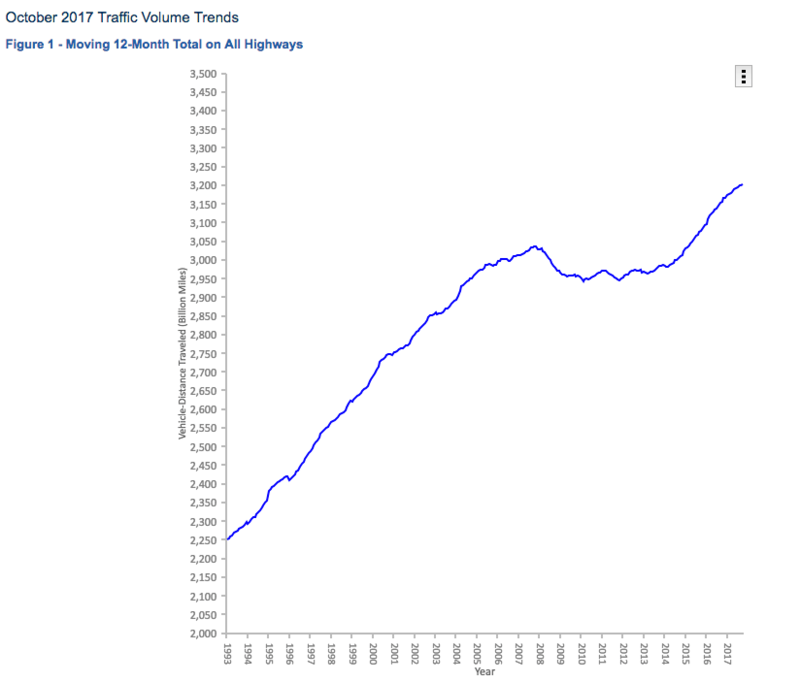 Data from the US Department of Transportation trace a clear uptick in driving in the past three years. The result, inevitably has been increased carnage on the highways. There’s some good news out of the Oregon Legislature in the past year. The legislature gave the city permission to set lower speed limits on city streets, and the city has just forwarded a new speed limit of 20 miles per hour that will apply to many of the city’s residential neighborhoods. In response to a community request to reduce the posted 35 MPH speed on the east end of NE Sandy Blvd, traffic speed counts were taken east of 85th Avenue in early 2014 as part of the High Crash Corridor evaluation. 85th percentile speeds were 40.3 MPH. The Oregon Department of Transportation (ODOT) reviews and makes decisions on posted speed reduction requests. ODOT will not consider speed reductions that are 10 MPH or more below the 85th percentile speed. Therefore, ODOT would not approve a speed reduction on outer NE Sandy Blvd near 85th Ave. The grisly trend indicated by the traffic death data of the past three years tells us that as hard as we’re trying to achieve Vision Zero, we’re not trying hard enough. The biggest risk factor is just the sheer amount of driving we do, and with the boost to driving in recent years from lower fuel prices, it was predictable that deaths would increase. If we’re serious about Vision Zero, we ought to be doing more to design places where people can easily live while driving less, and where people can walk without regularly confronting speeding automobiles. We clearly have a lot of work to do.